What about a hearty lentil stew? 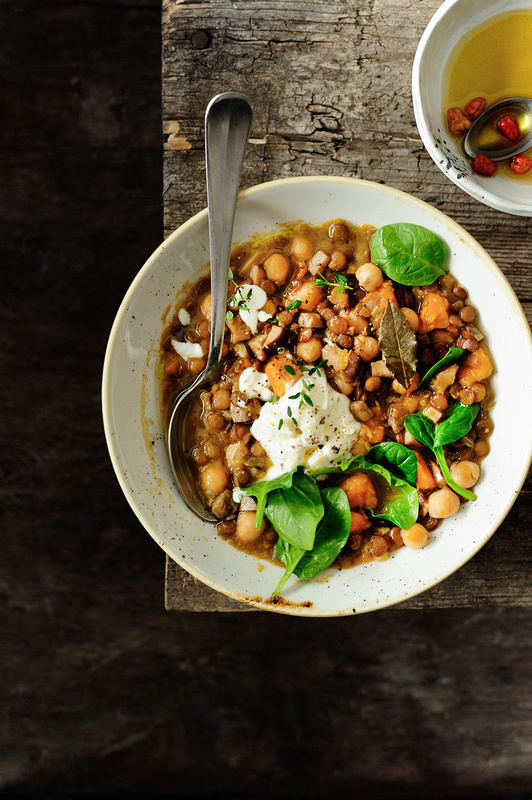 With chickpeas, sweet potato, mushrooms, herbs and spinach, a hearty vegetable broth base and green lentils cooked to perfection. Do you love lentils? I do, you can add them to many recipes, they’re tasty and loaded with vitamins. And it is said that they’re a nutritional fountain of youth, no complains over here!! Today I made a winter stew with these little pillows and a bunch of vegetables, then simmered to perfection to make a bowl full of comfort that will rock your winter mood! It’s a thick and satisfying stew with classic flavors and great textures, drizzled with a bit of chili olive oil and topped with a spoon of sour cream. Happy cooking! Heat the vegetable oil in a deep pan, I used a dutch oven, cook the onion and garlic until soft. Add celery, mushrooms and sweet potato. Turn up the heat and cook for 5 minutes. Add lentils, vegetable broth, thyme and bay leaf. Bring to a boil, cover and allow to cook for 30 minutes. Then, add the chickpeas and spinach, cook for 10 minutes more. Season with sea salt, pepper and a splash of lemon juice. Serve drizzled with a bit of chili olive oil and topped with a spoon of sour cream. Enjoy! This is my sort of winter fare, hearty and delicious! 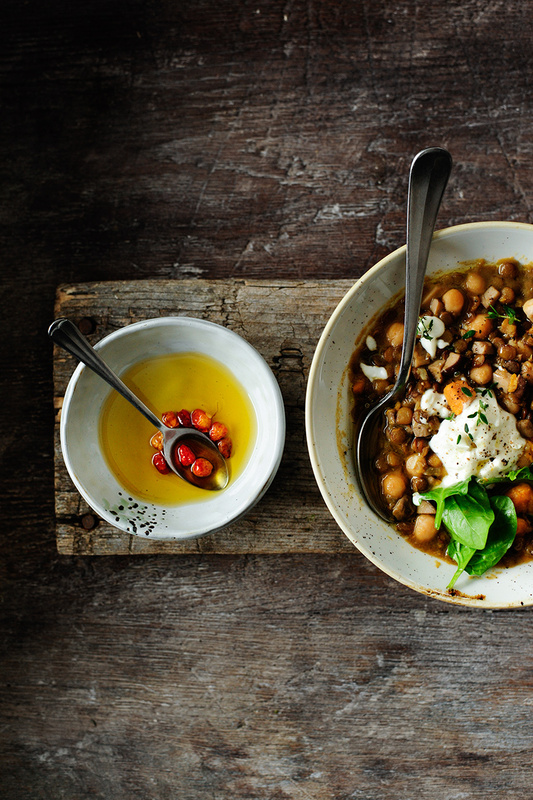 I love lentils and chickpeas and would be so happy with this lovely stew accompanied by a thick chunk of sourdough any day! Thank you! That sourdough bread sounds amazing! This looks so really comforting and full of goodness. I’m eating lentils a lot lately and this looks like a really hearty dish! I always like to serve these kinds of dishes with a dollop of sour cream on the side too. so happy you like this, thanks Kacie! Lentils are one of my favourite foods. I’m not sure the fountain of youth bit has quite worked on me though. I’ve been eating them ever since I can remember. Your stew looks so good and just perfect for this horrible damp, grey & cold weather. Pinned. This is just the right kind of meal for this horrible cold and damp weather we’re having at the moment. yes, so good right now!